The history of April Fools' Day is debated by historians. Many trace the custom back to medieval France where 25 March used to be New Year's Day until the calendar was reformed in 1564. Before then, New Year festivities culminated on 1 April. After 1 January was officially adopted as New Year's Day, those who forgot to change the date and continued to celebrate on 1 April were ridiculed and labelled April Fools. 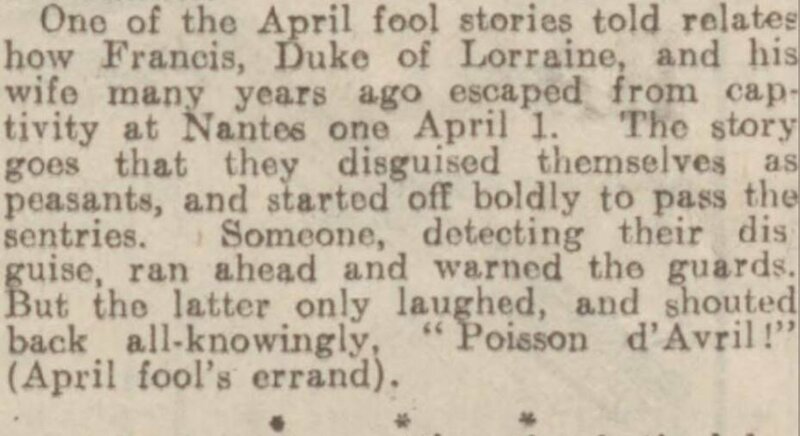 Whatever its origins, the long-standing tradition of playing a practical joke on All Fools' Day is prevalent throughout our historical newspaper collection. We've delved into the archives to bring you some of the most elaborate trickery. 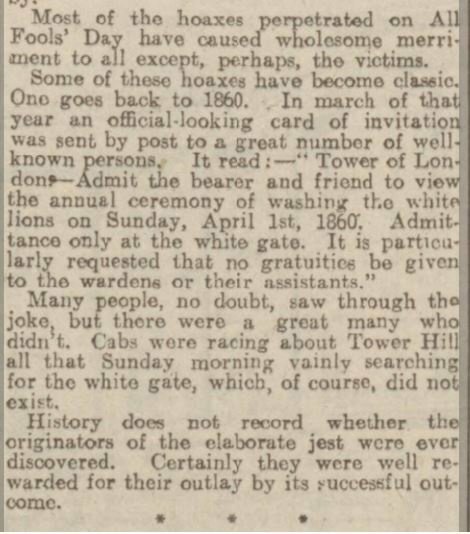 Possibly the first April Fools' hoax ever printed by a British newspaper, was in the Islington Evening Star in 1846 and resurrected by the Leeds Mercury in 1925. Leeds Mercury, 1 April 1925Image © Johnston Press plc. Image created courtesy of THE BRITISH LIBRARY BOARD. Of course, upon arriving at the so-called 'grand exhibition', the expectant crowds soon realised that they were the donkeys. In March 1860, what appeared to be official invitations for an annual lion-washing ceremony at the Tower of London were sent to many. The Dundee Courier recalled what happened in 1928. Dundee Courier, 31 March 1928Image © D.C.Thomson & Co. Ltd. Image created courtesy of THE BRITISH LIBRARY BOARD. With no white gate to be found, we imagine there were a lot of bewildered visitors at the Tower of London that day. 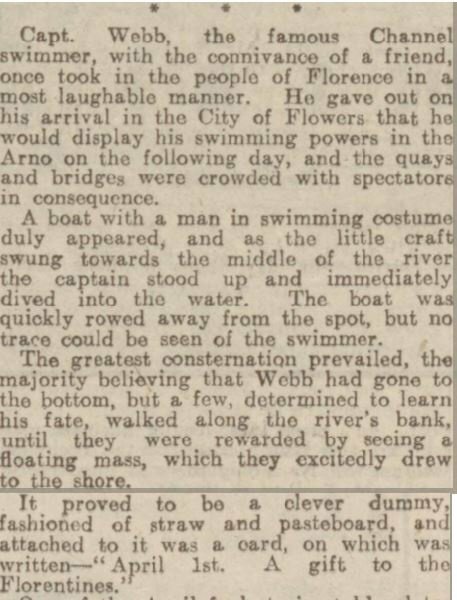 During an April visit to Florence, famous English Channel swimmer Captain Matthew Webb fooled the locals into thinking he had drowned. In a cruel twist of fate, Webb did drown in a similar stunt at Niagara Falls in 1883. 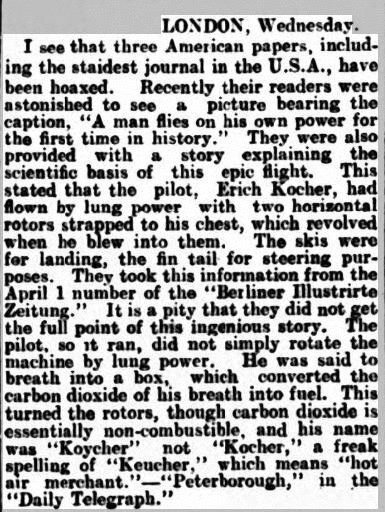 The 'boy who cried wolf' mentality is particularly common on the first day of April as this story proves. 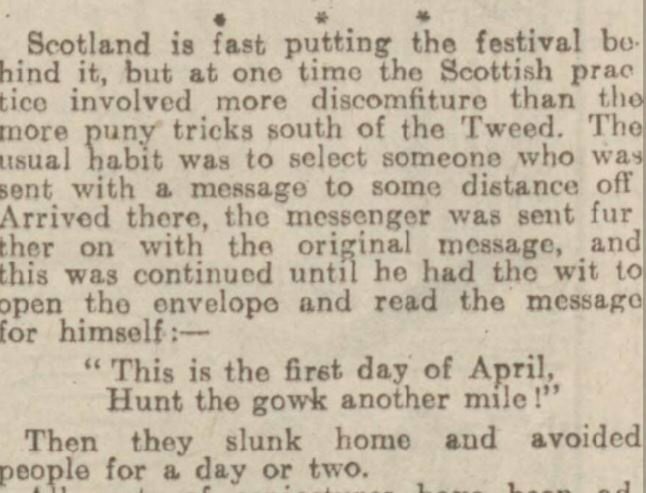 This Scottish April Fools' tradition is both cruel and hilarious in equal measure. We'd love to hear just how far afield some of those fools travelled. Sometimes, roles were reversed and the newspapers were hoaxed, as this Belfast Telegraph story explains. Belfast Telegraph, 2 May 1934 Image © Independent News and Media PLC. Image created courtesy of THE BRITISH LIBRARY BOARD. Although, it's fair to say that this sounds more like shoddy journalism than a deliberate ploy. 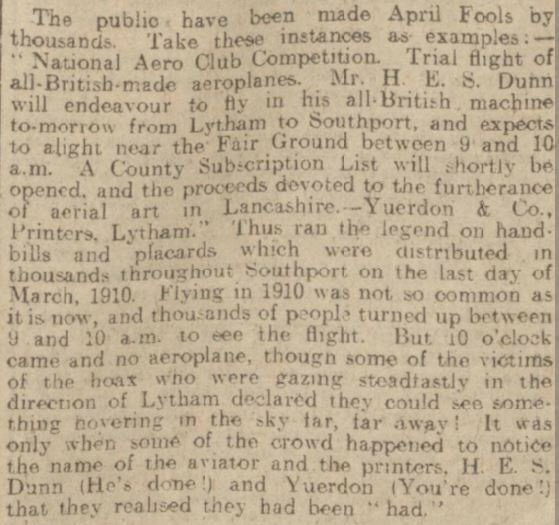 Thousands of Lancashire residents were duped by the promise of an air show in 1910. Western Gazette, 3 April 1914Image © Trinity Mirror. Image created courtesy of THE BRITISH LIBRARY BOARD. Taking printing costs and clever wordplay into account, the effort made by this prankster has to be admired. 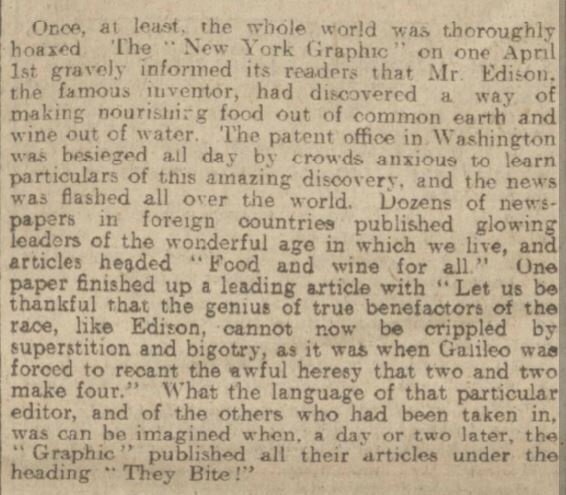 The Western Gazette reports how The New York Graphic once tricked its readers (and subsequently many around the world) into believing that Thomas Edison had invented a method of creating food from the earth and wine from water. More than any other hoax in our list, we really wish this one was true. Finally, an amusing example of a prank that peeved a world leader. Did your ancestors partake in some seasonal tomfoolery? Our ever-growing British and Irish newspaper collection is the place to look if you want to find out.